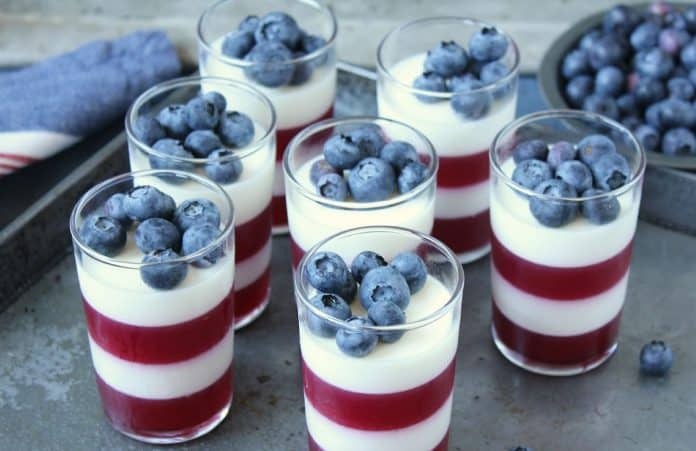 These yummy, all-natural parfaits are a great way to celebrate America’s birthday this Fourth of July. Load them up with fresh berries on the top, and watch your kids gobble them up. Most moms use Jello which is filled with artificial flavors, sugar, and food dyes. Why not try a healthier, and super easy, alternative?!? Instead of Jello, use unflavored Knox gelatin with fresh juice or purees. For vegetarians, try agar agar (a seaweed-based product that works just like gelatin — which is actually made of ground animal bones). In a medium saucepan, combine the raspberries and the sugar over low heat. Stir and smash the berries until the fruit is pulverized and the sugar has melted. About 10 minutes. Over 1/3 cup cold water, sprinkle the 3 1/4 tsp gelatin on the surface and stir, allowing it to dissolve. Once the raspberries are liquid, spoon the softened gelatin into the mixture and stir to dissolve further. Strain the raspberries through a strainer using a rubber spatula to press out the juices, leaving the seeds remaining. Set aside and allow to cool to room temperature. Make the Cream Layer: In a separate saucepan, combine the whole milk, heavy cream and the remaining 1/3 cup sugar. Simmer until the sugar is dissolved, stirring frequently to prevent burning. Over 1/3 cup cold water add the 2 tsp gelatin and allow to dissolve. Once dissolved add to the hot milk mixture and stir to combine. Remove from heat and cool to room temperature. Begin filling glasses or clear plastic cups by using the red gelatin first, about 3 Tbs. You can use a small funnel. Refrigerate the first layer 1 hour. Layer the cream mixture next, using a different funnel if desired, 3 Tbs. of mixture. Refrigerate 1 hour. Repeat for 4 layers total. If the mixtures begin to thicken, heat them slightly over low heat until liquid again. Allow to cool a bit before layering them. When ready to serve, sprinkle fresh berries on top. Yum!